I love this time of year at the market, when mountains of fragrant mangoes seem to surround me as I shop. Mangoes lure me in with their promise of sweetness and a juicy, tropical taste. When I thought about making a mango confection recently, I was skeptical at first. Could they be any better than they are plain? Would their natural sweetness make for a wince-inducing, sugary dessert? After much thought and experimentation, I decided to pair my mangoes with a crispy graham crust full of macadamias, coconut and lime. Then I slathered the creation with fluffy vanilla meringue and toasted it like a marshmallow. The result was a perfect spring treat, and it disappeared before I knew it. 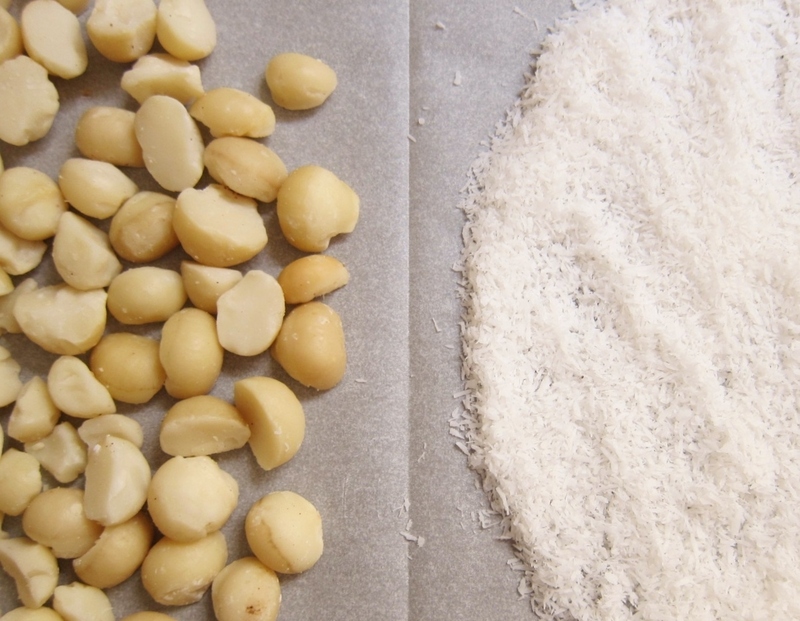 Preheat oven to 325 F. On a large baking sheet, spread out the coconut and macadamias separately, side by side. Toast in oven for about 5 minutes, until edges of nuts are golden brown, coconut is browned, and both are fragrant. Leave oven on. Finely zest and juice the lime; set juice aside for later. Crush graham crackers into even, fine to medium crumbs. Once they are cool, chop the macadamia nuts finely. Lightly grease a 9” pie pan, preferably glass. 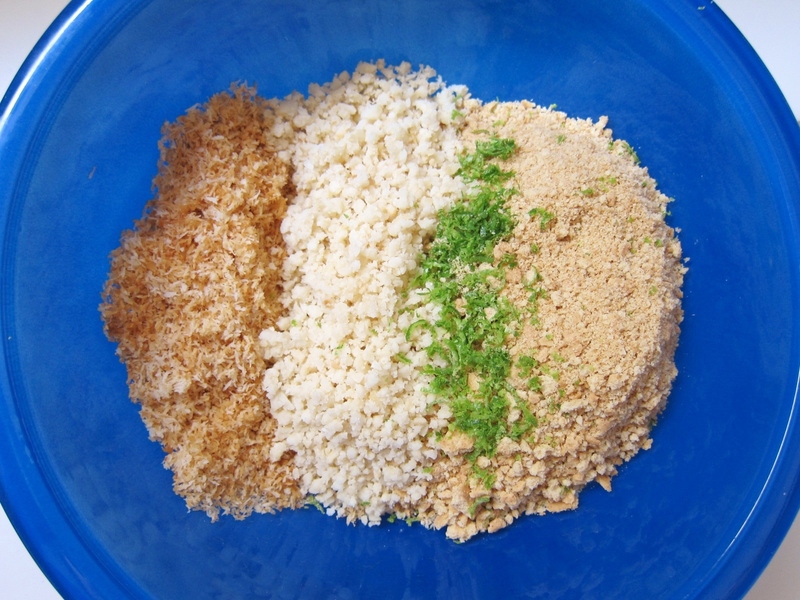 Mix coconut, nuts, lime zest, crushed graham crackers, flour, salt (if using), and butter until moist and even. [TIP: Drier graham crackers and/or larger coconut shreds or nut pieces can make this crust stubborn about sticking together. If you have this problem, try gradually adding a little more melted butter, and/or pulsing the ingredients in a food processor before pressing into pie pan.] Using the back of a spoon, press mixture evenly and very firmly into pie pan, holding it up to light (if glass) to avoid thin spots, especially in the center. Bake for 20 minutes, then let cool to room temp. Cut mangoes and discard pits and skins. Place in food processor and blend until smooth and creamy, about 3 minutes. Place lime juice in measuring cup and add water to make ½ cup liquid total. Heat the mixture to scalding (a minute in the microwave will do). Whisk gelatin and powdered sugar into the liquid; mix rapidly until all powder has dissolved. Quickly pour into the mango puree and blend for another minute or so. Transfer the mixture to the cooled crust, cover with tin foil, and chill for at least 3 hours. (My fridge is not the coolest, so I placed mine in the freezer for one hour, and in the fridge for the other two; the texture was perfect.) 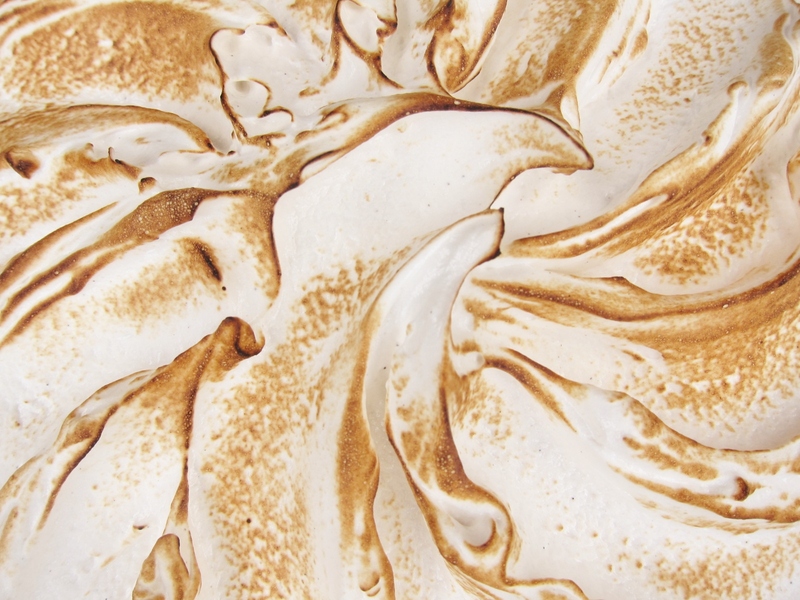 When ready to serve (within a day), make the meringue. Mango meringue pie is vivid with complementary flavors. The crumbly, coconutty crust is perfectly studded with rich macadamia pieces, and the trace of lime is just enough to highlight the tangy fruit filling. Mango lovers are sure to enjoy the almost-purely mango filling, while those with a sweet tooth will happily devour the sweet meringue topping. Taken all together, though, this pie is surely at its best; after all, there is a marvelous magic that happens when creamy, sweet, fruity and nutty meet in one bite. Maybe next time… If you like your meringue piled high and your pie on the sweeter side, feel free to double the meringue recipe above. If you don’t have a kitchen torch (yes, it’s one of the most unnecessary yet addictive cooking gadgets), you can instead heat your oven to broil with a rack at the top position, and place the pie there for about a minute. To make this pie dairy-free, replace the butter in the crust with melted coconut oil. To make it vegetarian, experiment with agar agar in place of gelatin (though I’m afraid I’m not experienced enough with agar to give instructions; it acts different from gelatin). I think this pie would work well with other pulpy tropical fruits, such as pineapple, in place of the mango. Finally, if you want a chunkier pie, reserve some cubes of mango and fold them into the puree just after blending in the gelatin. This entry was posted in Pies, Tarts, Tortes & Cheesecakes, Sweets, Traditional with a Twist and tagged baking, coconut, dessert, fruit, lime, macadamia, macadamia nuts, mango, mangoes, meringue, pie, recipe, recipes, sweets, tropical. Bookmark the permalink. This looks amazing do you happen to have any methord on how to present the merginge the way you have as it looks very attractive. P.s i have just started year 10 food tech and for my first practical is this so i would really appreciate your advice! Thanks for stopping by! I basically plopped all the meringue on top of chilled pie, then gently spread it to the edges with a small offset spatula. Then, drag the end of the spatula in a curve from the outside edge to the center of the pie. Rotate and repeat until all the meringue is swirled in this fashion. Gently toast with a kitchen torch held upright. I loved the recipe! The only thing is I had a hard keeping my crust to stay together. Hi Lehua: Thanks so much for stopping by, for sharing your kind words, and especially for trying the recipe! I’m so glad you liked it — but I’m very sorry to hear about your trouble with the crust. Sometimes if the graham crackers are on the drier side, it can help to add more melted butter. I am going to do some trial and error and will add a note about that in this post, thanks to your feedback. With gratitude! Such a wonderful idea and such a beautiful pie! Mangoes are my favorite as well. We had a couple Mango trees in our backyard when I was a kid, so we always had fresh mangoes in the house. Thank you… And YUM! I bet those were some great mangoes! This is all I need in life and I’m not even a pie person (although this may very well be changing)! 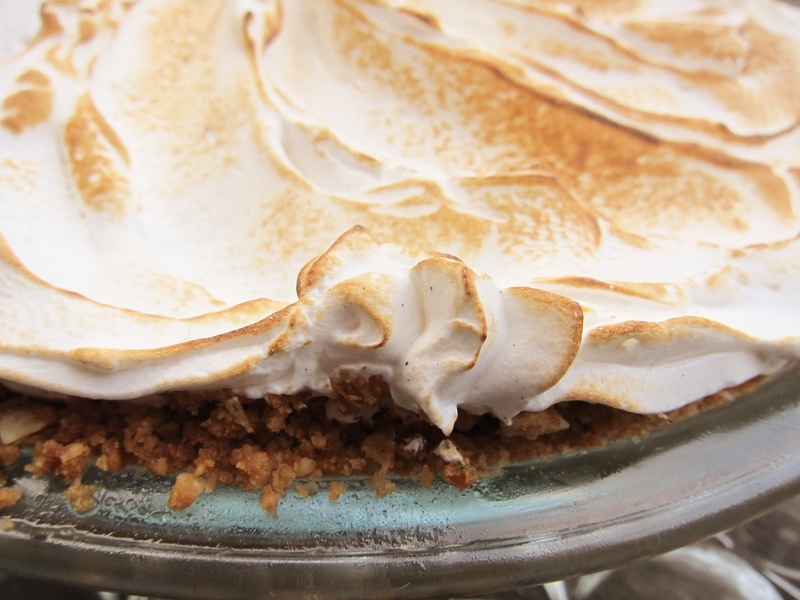 I love the sound of the nutty crust, the addition of meringue (interestingly enough, lemon meringue pie was my dessert of choice as a child) and the look and sound of the whole thing. I’m constantly in awe of your baking prowess. Thanks so much, Katy! Pie is not my favorite, either (except when it’s completely buried in ice cream) — but I am trying to expand my pie-rizons 🙂 and it’s proving to be pretty yummy so far! Oh my goodness, this looks heavenly! The crust is just inspired;) I had a slice of mango pie on our honeymoon in Hawaii, and I was a little afraid it would be too cloyingly sweet, but it was just perfect. Yours looks even better! Thanks so much, Cameron! After publishing the post above, I actually heard about your honeymoon mango pie in the hallways of Dwinelle 🙂 — and I’m looking forward to finding your post about it. I think we might need to make it a goal to try as many varieties of mango pie as possible in this lifetime, don’t you? 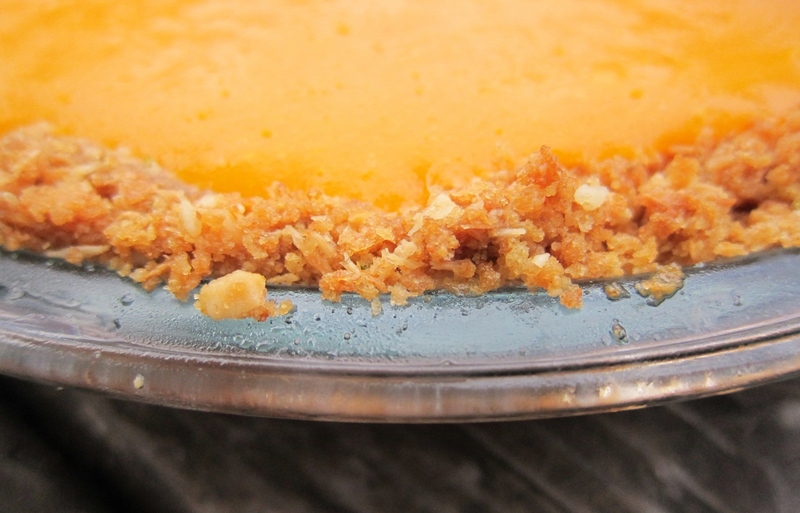 Mango, coconut, and then you have to really rope me in with the macadamia nuts! This all sounds too good to be true & you’ve done such a beautiful job with every bit of the presentation. Love those swirls. Thank you, Diane! I wish I could bring you a slice right now! This looks absolutely heavenly! Yet again you have created such an incredible-looking creation. Marvelous magic, indeed! Beautiful colors and pie! I am sure it must have been quite delicious!